... but you know what, I should be fair. It just didn't work for me. Evens tone and boosts glow. I can honestly say that no, it didn't even tone - it wasn't pigmented enough to rise to the challenge of my slightly maturing skin with its very slight rosacea and slight hyper-pigmentation here and there. It did boost glow, but only because it made my skin look like an absolute oil slick, despite severe powdering. Blurs imperfections. See above. Nope. In addition, I have been somewhat run down of late, and have a few tiny blemishes. Despite the fact that these were small and not terribly noticeable, these still needed concealer. Smoothes fine lines. I will be honest and not comment on this one, I don't use foundation or BB cream anywhere near the very fine lines around my eyes; I always use corrector there so I don't overload it with layer foundation underneath of the corrector/concealer. 24hr hydration. Agreed. If you can count normally-combination-skin-turned-into-an-oil-slick as "hydration". I appreciate this may seem unduly harsh, so let me caveat this by saying perhaps it would work for dry skins. Perhaps. Even on my dryer areas however, my skin was oily while wearing this stuff. Extremely light coverage, nowhere near pigmented enough to be terribly useful if you don't have pretty much flawless skin already. However it doesn't feel lightweight - I could feel this on my skin. Yuck. Supposedly "radiant" and "luminous", I'd argue "extremely dewy to the point of oiliness". 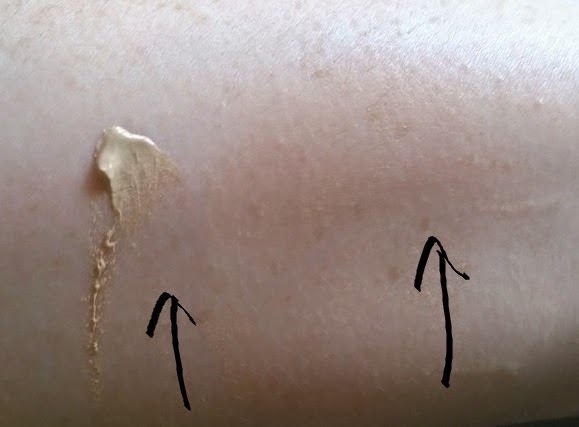 There are two shades only, which is not unusual for BB creams - Light and Medium. I wore Light, it was more or less perfect for my NC25 skin of late. This just didn't last me, it wore away and faded away and transferred away, despite powdering. I tried for a few days, and gave up. A paddle brush or fingers worked best for me, I got a bit more coverage when I warmed it up a little and then applied it with my fingers. It didn't build particularly well, further layers really just sat on my skin, and trying to work it in, really just blended it away to nothing. If one layer is all you're after, it does blend nicely into the skin however. This is a fluid-cream, containing mineral pigments, and surprisingly, given how it wore on me personally, some semi-decent ingredients. It's water-based and features glycerin (that might explain the oiliness of my skin, but I've used plenty of products containing glycerin without this problem) and a tiny amount of hyaluronic acid (for moisture retention). At €14 for 50ml, not a bad price, and featuring an SPF15 (which seems to be chemical as opposed to mechanical - and I haven't found it to flash back particularly, if this is relevant to you). Personally, I just didn't find it covered sufficiently, lasted sufficiently, or looked particularly well on my skin. Get a sample if you can and see for yourself. I could see this working on extremely flawless, perfectly youthful but dessicated skin (is there such a thing?!) but not on anyone else. Maybe some of the other formulations would work better... look here if you'd like more info.